Playgroups: playing to get ready for school was written in 2006 by Anne Shinkfield and her colleague Beryl Jennings. 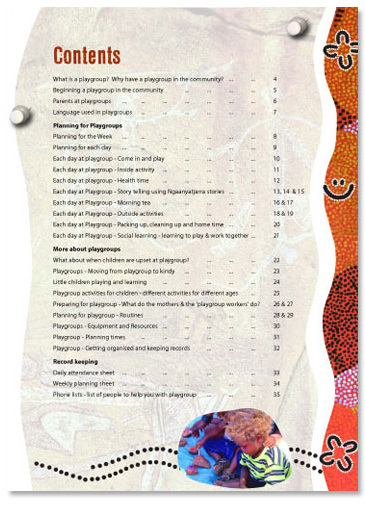 "This booklet is written to assist family members set up playgroups for children in the communities located in the Ngaanyatjarra Lands in Western Australia. It is based on the shared experience of Anne and Beryl working with playgroups in the communities of Blackstone and Warburton from 1995 — 1998, and from many conversations since then about women and children learning at playgroups together." The book describes the questions to consider before setting up playgroups, the roles of mums at playgroup, planning for playgroup activities and how children learn while they are playing. When using this book with community groups, we've found it is most user friendly when each page is laminated and the book is wire bound.